Photo: Seattle Department of Transportation. There’s good reason bicyclists feel safer inside bike lanes. A new study by the University of Minnesota finds that drivers are less likely to pass cyclists at a dangerously close distance if there’s a bike lane — particularly if the bike lane is physical separated from traffic. The findings are rather intuitive, but it’s still helpful to have hard data backing up the case for first-class on-street bike infrastructure. A team of researchers used a bike-mounted radar and GoPro cameras to measure passing distance for 3,000 bike-car interactions on five types of streets: those with a buffered bike lane, a bollard-protected bike lane, no bike lane, just a shoulder, a standard bike lane and one configured as a bike boulevard. Regardless of street design, very few drivers passed closer than three feet — but a majority of those close passes, 64 percent in fact, occurred on roads without bike lanes. And there were zero unsafe passings on roads with bollard-protected bike lanes or buffered bike lanes. “[It’s] evidence that investments in these types of bike facilities may reduce potentially risky interactions between vehicles and cyclists,” said Greg Lindsey, the University of Minnesota professor who co-authored the study. Make that male cyclists. The study also found that drivers behaved more dangerously around female riders, passing, on average, three inches closer to female cyclists. Of all the unsafe passes in the study, 73 percent occurred against female cyclists. Studies show that women favor protected bike infrastructure because they tend to feel safer. Here’s more evidence why. I’m very curious what the average passing distance is in NYC–three inches? When you make passing too closely physically impossible, it doesn’t happen. Who knew? Drivers gripe about bicycle facilities all the time. This study makes clear the bike lanes wouldn’t exist in the first place if drivers followed the law. I think the “problem” for women is that they tend to follow the rules much more than men. I routinely see women doing the right thing and take the full lane and bike a safe distance from parked cars (and car doors). Unfortunately this puts them at greater risk of aggressive drivers who don’t care about the rules or don’t know the rules. The sad thing is the rules of the road favor drivers and many times when cyclists obey vehicular rules they put themselves at greater risk. In addition to safer bike lanes, we need laws that default to blame the driver with severe penalties for any collusion. In several places (such as the Netherlands) such laws exist, and drivers make darn sure that they aren’t going to hit anybody because they fear the consequences. The NMA joined with the Michigan League of Bicyclists to help pass a new Michigan law requiring a minimum of 3 foot clearance for vehicles passing cyclists. I see it being well complied with so far. @disqus_deJpTCl2Qe:disqus, the Dutch law doesn’t actually have penalties because it only deals with insurance. “Very few” is too many. If it’s happening 0.5% of the time, that still leaves most commuters with a few dangerous passes everyday. If being a cyclist means having a couple near death experiences everyday, then people are never going to get out of their cars and onto a bike . In other research news, it has been discovered that the longer you live, the older you get. I do find it interesting that the research also indicated very few close passes occurred regardless of the infrastructure. Now, as for those pesky intersections, which is where most collisions in an urban environment occur…still a lot of work to do. In other places, close passes by vehicles are very common regardless of what the law says. A car psychically brushing against my side while passing is something the happens from time to time. Yes, intersections are the real danger zones. Many bike lanes end just before an intersection. Many of the intersections between streets and off street trails are very dicey. I’m curious about the rate of right hooks and almost right hooks that occur on the different types of bike lanes. THIS! I’d personally love it if the person loses their license for a year or two. Yes, just infrequent brushes with catastrophe are enough to deter bicyclists. I’ve noticed multiple situations where a streets that put cars and bikes in direct conflict were restructured with road diet that added bike lanes. The result was a huge jump in bicycling. Valencia St. in San Francisco. Evelyn Ave. in Sunnyvale, CA. Lincoln Ave. in San Jose, CA are some good examples. Allow people to feel safe and they’re more willing to get out of their air bagged protective car cages. Not to nitpick, but is it possible drivers pass closer to female bike riders because women are smaller than men on average? And given how some people (mostly teenagers and young adults) drive around here in Zeeland, whipping down very narrow city streets or around blind corners at 40-50 Kph, I don’t get the impression at all that this policy is actually having any effect on their driving behavior. And this also despite the fact that the driving age is higher, you have to go through way more training (and pay a lot more) to get a drivers license and practically all drivers are/were cyclists as well. I mostly find the tourists from Belgium and Germany to be much more considerable, likely due to the fact that they are not as used to all the cyclists and the road layout of the Netherlands. Dutch drivers tend to pass more closely and quickly. Psychically?! I knew cars distorted people’s mindsets, but I didn’t know they had literal mind control! Sure, it’s obvious, but sometimes you need somebody to just say the obvious stuff. Is there any evidence online about this partnership or support? I see nothing about it on either the MLB or NMA’s websites. You would need to look up the hearings for the bill before it became law and find our testimonies. Mine are almost always written as well as oral. The LMB head did a lot of the work offline with hearing committee members. The NMA has an email list between active members and I kept them informed of how the bill and the negotiations were going. There are times that cyclists and drivers have different goals, but in this case our views coincided quite well. For context: after a driver killed five people on bikes in Kalamazoo County, our senator introduced a statewide 5-foot passing law that quickly passed the Michigan Senate. (The area municipalities already had local 5-foot passing ordinances.) The House then buckled and gutted this bill and we got a 3-foot passing law. I should hope it’s being complied with so far; three feet is such a close distance (just over an arm’s length) that any number of dangerous driving or menacing laws would already apply if someone drove any closer. That’s a strange way to spell ‘no’, Jim. To be clear and fair, I don’t know James or have any knowledge of his organization’s effort on this process. The LMB was happy with the result, which got something (3 feet) instead of nothing, to their view. Online, yes, Frank Kotter. Written testimonies are available in the hearings records of the Michigan Legislature – but you have to search for them – something I am unwilling to do first to give you the locations. Improper accusations don’t deserve my time. BMUFL. Always! I don’t want this junk to be in my city. Right hooks forgot about it with BMUFL. Close passes are their own fault form riding to close to the white line. A fair number occur with bike lanes. It has been an ongoing issue for decades and is why there is so much attention being paid to the “protected intersection” which is still a misnomer. It is also a difficult design to achieve in a dense, built-out urban environment. Take a look at Dutch design where that style of intersection is used with a “cycletrack” and you will see it is in very large intersections with a lot of right of way. It may not look large due to not having a lot of travel lanes, but start measuring things, including the sidewalks since they get pushed back, and things get big quickly. The bike box has also been an attempt to deal with the right hook, however it only works when a bicyclist approaches on a red light and can stage ahead of the right turning traffic. Arrive at signal startup, or on a green and it provides no protection, and in fact can contribute to false expectations. 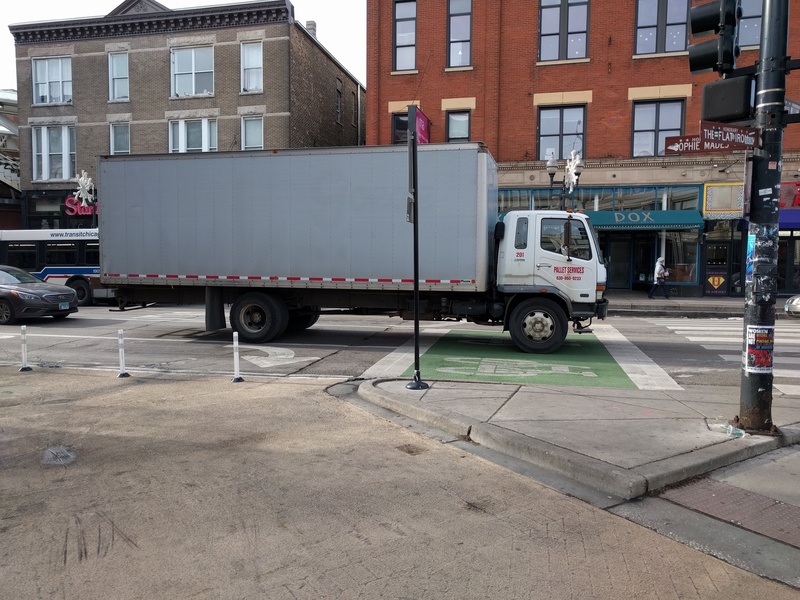 There have been a number of fatal right hooks by large vehicles (with blind spots) at intersections with bike lanes, and even with bike boxes. Also, previous research has shown that drivers tend to move left less when there is a bike lane, and bicyclists tend to ride a bit farther to the left (not being gutter bunnies) thus potentially not allowing the full 3′ passing required now in most states if it is just a basic bike lane with a lane line. Here is a truck stopped in a bike box. It is better to have separate bike and car signals. Bikes get a green light, cars get red arrow. This study turns out to be a bit of a joke. It postulates that safety can be measured and summed up in the separation from a passing vehicle. It doesn’t look at speed, traffic volumes, turning conflicts, etc. In other words, it didn’t look at actual exposure. It essentially implies that bike boulevards are the least safe as a result. Ask yourself where you would feel safer; riding on a traffic-calmed neighborhood street where you encounter a small number of vehicles, driving at lower speeds, but in a mixed environment; or riding in a “protected” bike lane with hundreds of vehicles and turning conflicts at numerous intersections. Then go the middle ground and consider a buffered bike lane, with only spatial separation, high volumes, high speeds (35-45mph), and multiple turning vehicle conflicts at every intersection. See the full study above, they include AADT, speed limits, # lanes, ride distance, etc. Turning movements would be a great addition to this study.